Assign any drugs, as well as medicinal plants should be very careful. Apparently, there is a mother in urolithiasis. A cyst — a vybolevshaya kidney tissue, which usually appears after suffering and inadequately treated pyelonephritis or as a result of a long course of chronic inflammation of the kidney parenchyma. Urolithiasis disease. It is necessary to determine the form of salts. 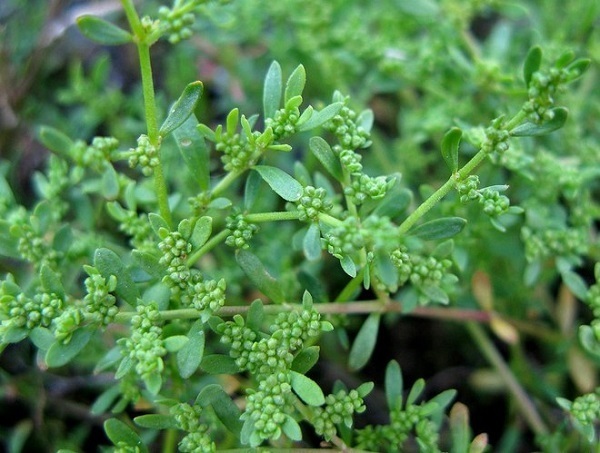 With urolithiasis should actively but carefully use kidney herbs. Simultaneously it is necessary to comply with the proper diet for salts, which are determined by urinalysis. To identify them, it is necessary to make a general analysis of urine, indicating salt that are present in the sediment. In most cases salts may be oxalate, urate, phosphate. With regard to medicinal plants, it is because we do not know the composition of rocks, it is necessary to use a universal plants that often help with these and other calculi. Most often this knotweed, or knot-grass, gryzhnik, bedstraw, cranberries and others. Knotweed has diuretic, antiinflammatory, antibacterial, disinfectant action, prevents the formation of urinary calculi and salts due to the presence of silicon compounds and other active substances, and dissolves and leaches out of the kidney and bladder salts have appeared. Use it in diseases of the kidneys and bladder (chronic pyelonephritis, cystitis, urolithiasis), edema of the lower extremities of renal origin; in violation of mineral metabolism. Herbs (1 tbsp. L), pour 0.5 liters of water. On a small fire to boil with the lid closed for 15-20 minutes. Infuse for 45 minutes. Drink 4-5 times a day regardless of the meal 1/3 cup. The course is at least 3-4 months. Gryzhnika has a diuretic, antispasmodic, antibacterial effect, prevents the formation of kidney stones and bladder, removes salt and toxins from the body. Gryzhnika — this is one of the best plants that are used in urolithiasis, chronic pyelonephritis, cystitis, in violation of mineral metabolism. • Infusion: 1 tablespoon. spoon grass to fill in 0.5 liters of water. Boil with the lid closed on low heat for 15 minutes. Infuse for 40 minutes. Drink 1/2 cup 3-5 times a day without regard to meals. The course is from 2 weeks to 2-3 months. grass Knotweed, gryzhnika, willow-herb, bedstraw, tsetrariyu — 2 parts peppermint herb — 0.5 parts. 1 tbsp. spoon collection pour 0.5 liters of water. Boil on low heat with the lid closed for 15 minutes. Infuse for 30 minutes. Drink 0.5 cups 4 times a day without regard to meals. The course is 2-3 months or more. Given that there is a cyst in the kidney, should be at home to cook drops Celandine on alcohol. Take 50 grams of celandine herbs, pour 0.5 liters of 70% alcohol. Insist 20 days in a dark place at room temperature. It is necessary to drink 3-5 drops (depending on body weight) with 1/3 cup of water in the evening 21-22 hour long courses of 2-3 months or more.